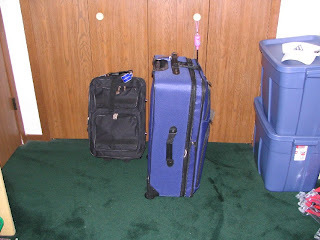 Here's my suitcases, I'm all packed and ready to go. I will depart from the charter terminal at the Minneapolis/St. Paul International Airport on Sunday night at 7:20 pm cst and arrive in Reykjavik, Iceland at 5:30 a.m. who knows what time zone. From Iceland, I'll fly to Copenhagen, Denmark, to board the Crown Princess and begin my cruise, which is the first leg of this trip.